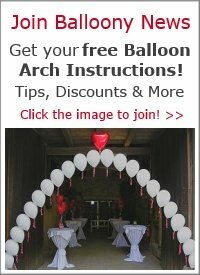 A floating balloon arch is perfect for creating a beautiful walk through decoration or for framing the head table at a wedding reception. Here we show you how to put together a classic 'String of Pearls' floating arch. 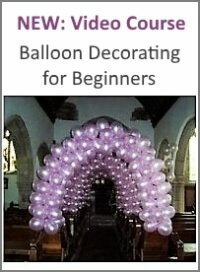 Before you start building the balloon arch, you need to know how long your line should be and how many balloons you are going to need. Click here for the formula. The bases here are the same design as used for the balloon bouquet 'Simple & Elegant', just a bit bigger, roughly 9cm diameter. 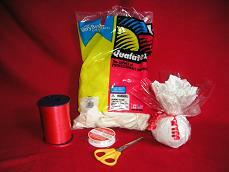 Take one end of the nylon line, pass it through the hoop on one of your pre-prepared bases and tie it with two or three securing knots (fig. 1). 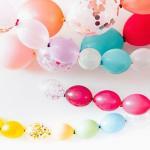 Unroll as much of the line as you need, but don't cut it at this point, until you have all your balloons attached. Not only will it make the arch easier to handle, but you also eliminate the risk of winding up short on the length. As the old carpenters saying goes: "You can always cut it off, but you can't put it back!" Unless you have an assistant to hold the other end of the line, you can stretch it out between two chairs and temporarily tie it off. 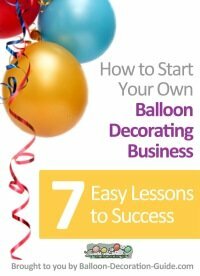 This will save you wrestling with the line as you're attaching your balloons and give you a comfortable working height. 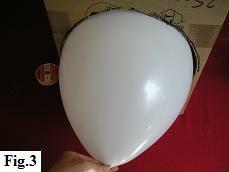 Take the first of your balloons and inflate it with helium, keeping a firm grip around the neck (fig. 2). 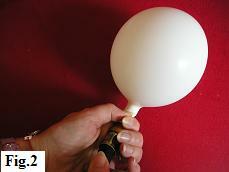 Check its size with your balloon sizer and inflate or deflate as needed (fig. 3). 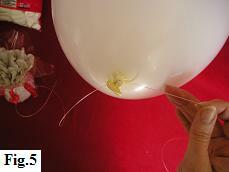 Now comes the tricky part, knotting the balloon directly onto the line. If you've already looked at our tip how to tie a balloon knot, it's pretty much the same except that as you stretch out the neck the line should be running over the top of it (fig. 4). 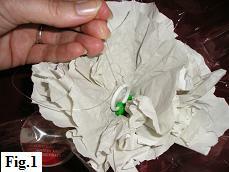 And as you start tying, the knot will form around the line (fig. 5). 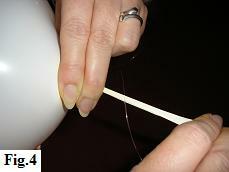 Sure, it's a bit fiddly, but by the time you come to your last balloon you'll be doing it like a 'pro'! Click here for the final steps of your 'String of Pearls' Arch.